Every two or three years a period of unusually cold winter weather results in the land and water north as well as in central Ohio being covered with snow and ice for a prolonged period of time. 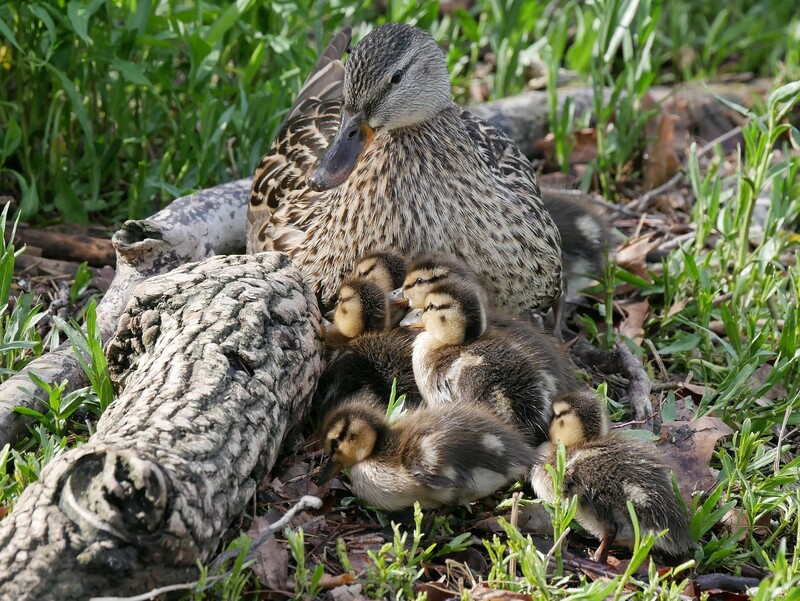 When this happens waterfowl and other birds that may not be able to make a living further north are forced to seek suitable habitats in our area. 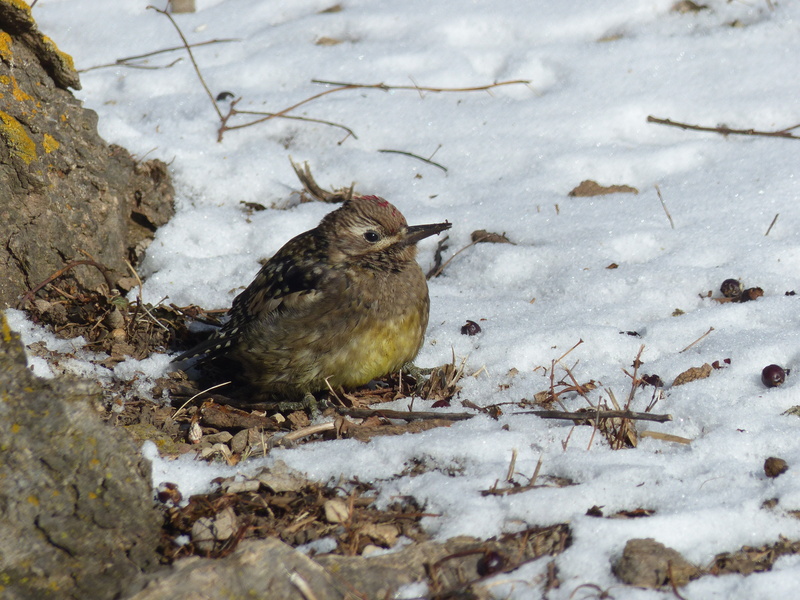 The result is the opportunity to see birds in locations where it would be extremely unlikely other times of the year. A gift to nature lovers courtesy of cold arctic weather. Ice creeps out into the Scioto River below Griggs Dam. The negative to all of this is that windy 0 F to 15 F temperatures preclude the use of serious photographic equipment on long hikes. Briefly popping out of the car, if you are able to get close enough to your subject, is the only option. If one is set on doing a long hike, stuffing a smaller superzoom under your coat does work but fingers freeze almost immediately when you try to manipulate the camera. 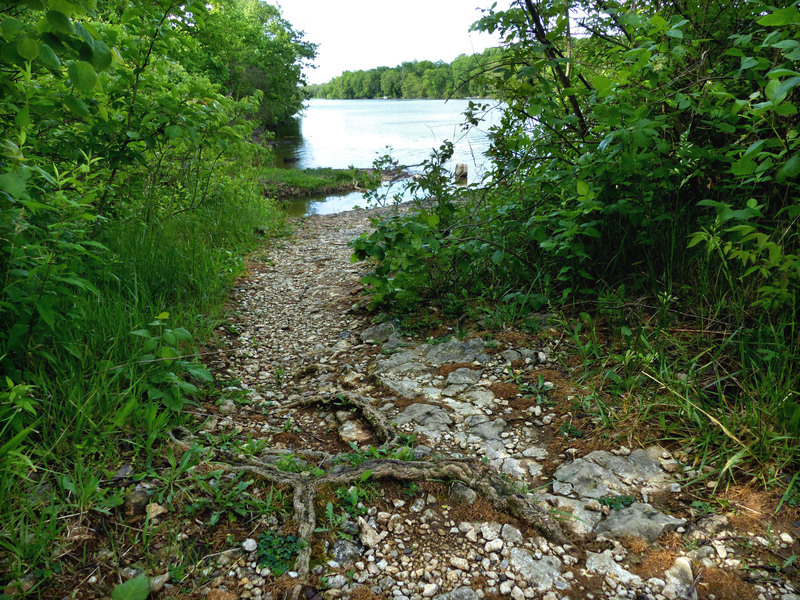 Landscape transformed, Scioto River below Griggs Dam. A habitat that attracts birds almost at our doorstep is the open flowing water of the Scioto River below Griggs Reservoir Dam. In the past couple of weeks we’ve been fortunate to observe a variety of waterfowl at that location. 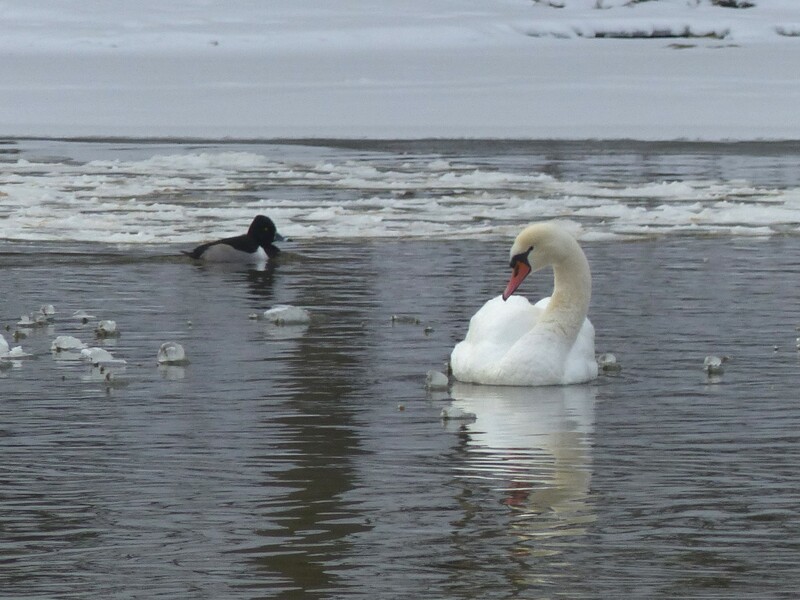 Others birds, such as Trumpeter Swans, have been reported but we’ve yet to see them. Timing is everything as the birds move up and down the river corridor. More often than not there is a least one Bald eagle present as the number of ducks and geese make for easy pickings. Ring-necked Ducks, Scioto River below Griggs Dam, (Donna). Crowded conditions, Scioto River below Griggs Dam. 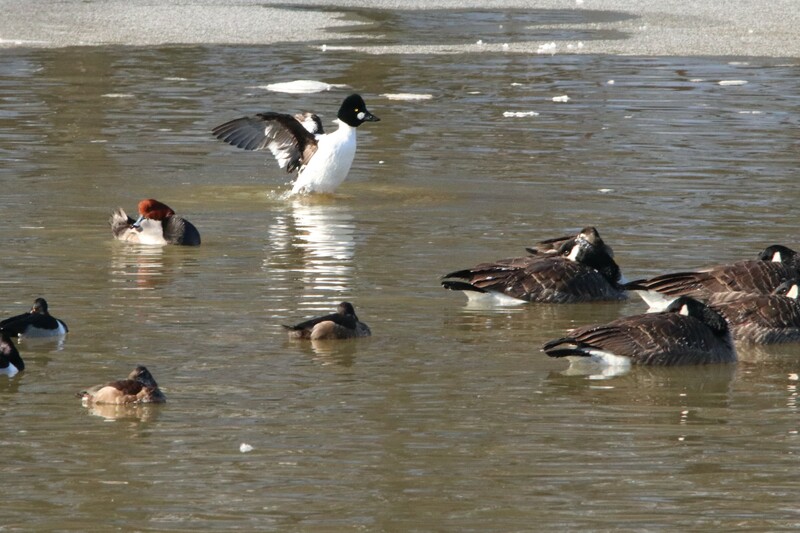 A Red-headed Duck tries to ignore a rambunctious Goldeneye, Scioto River below Griggs Dam. Male Hooded Merganser on patrol, Scioto River below Griggs Dam. This one found a crayfish. Did you know that 21 species of crayfish call Ohio home. 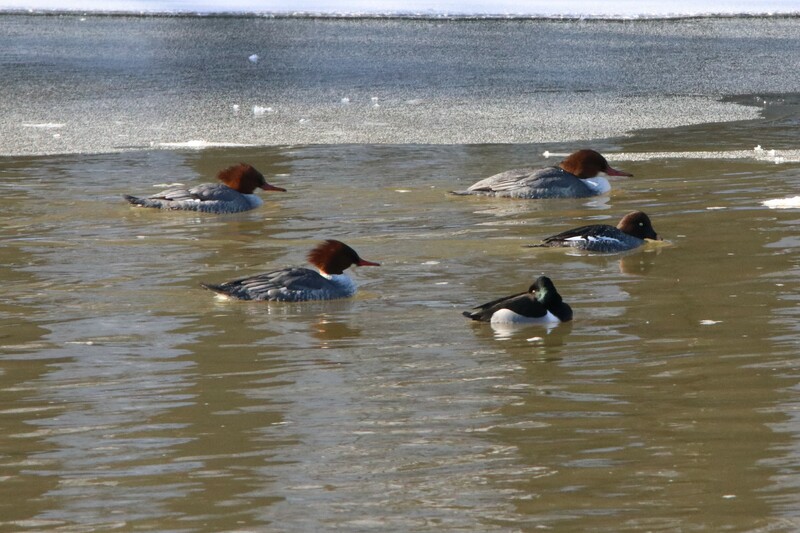 There were no shortage of Common Mergansers, Scioto River below Griggs Dam. 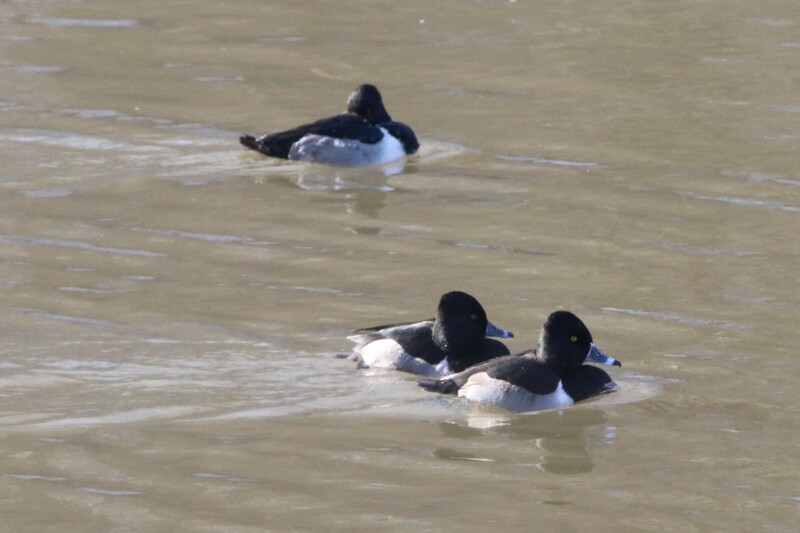 A nice group of male Common Goldeneyes, Scioto River below Griggs Dam. Canvasback a little too far away for a decent pic, Scioto River below Griggs Dam. Mute Swan, Scioto River below Griggs Dam. Cackling Geese, shot is courtesy of our follow birding friend Ed, Scioto River below Griggs Dam. This buck seemed confused about the best place to relax. We thought it might be sick or injured but the next time we checked it was gone, Scioto River below Griggs Dam. Red-headed Ducks, Scioto River below Griggs Dam, (Donna). 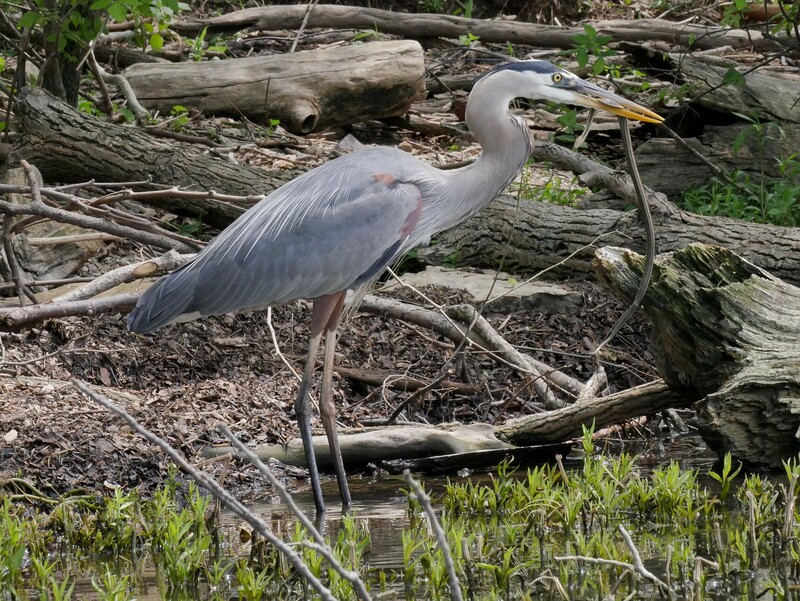 Amazingly, Great Blue Herons continue to make a living along the Scioto. 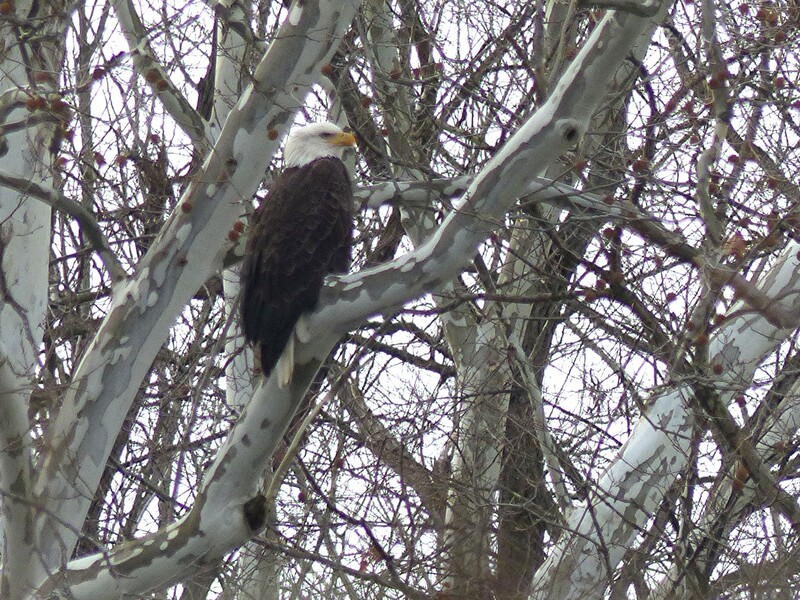 There is often at least one Bald Eagle observing the activity along the Scioto River below Griggs Dam. It’s also been a good year for Snowy Owls in Ohio with numerous birds being reported. The mechanism for that invasion, while perhaps partly due to the weather, also is the result of the past breeding season being a good one resulting in young owls looking for new hunting grounds further south as the increased population puts pressure on resources further north. 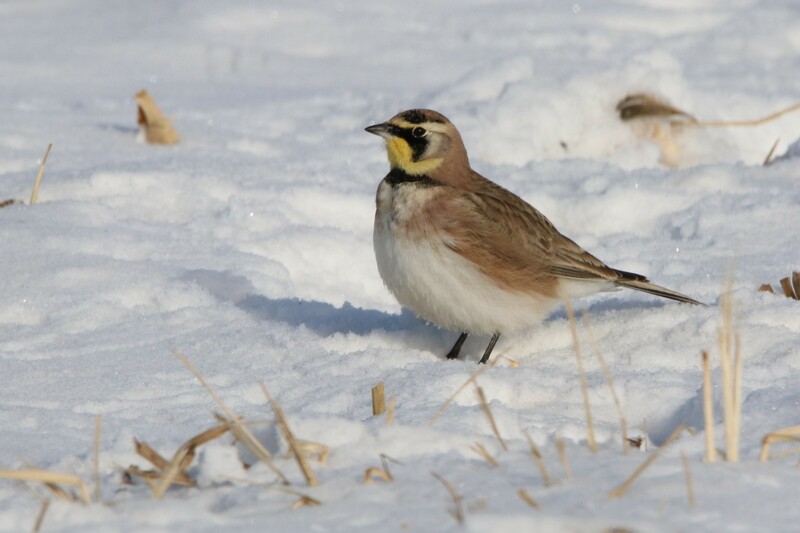 Other birds such as Horned Larks and Lapland Longspurs, to a greater or lesser degree, find their way into Ohio from further north during most winters. Along farm fields not far from our home a roadside spill of corn attracted Horned Larks, a real treat to see. “The barer the ground, the more Horned Larks like it. Look for them in open country with very short or no vegetation, including bare agricultural fields. They breed in short grassland, short-stature sage shrubland, desert, and even alpine and arctic tundra.” Ref: Cornell Lab. At the same location, at first looking like some type of sparrow, was a Lapland Longspur, another first for us! 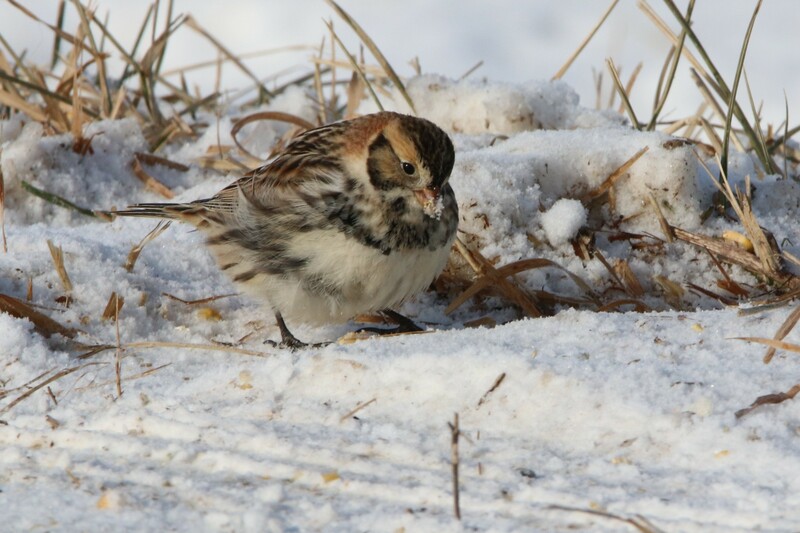 They are a common songbird of the Arctic tundra, and winter in open fields across much of the US and southern Canada. Other creatures have also been braving the cold. 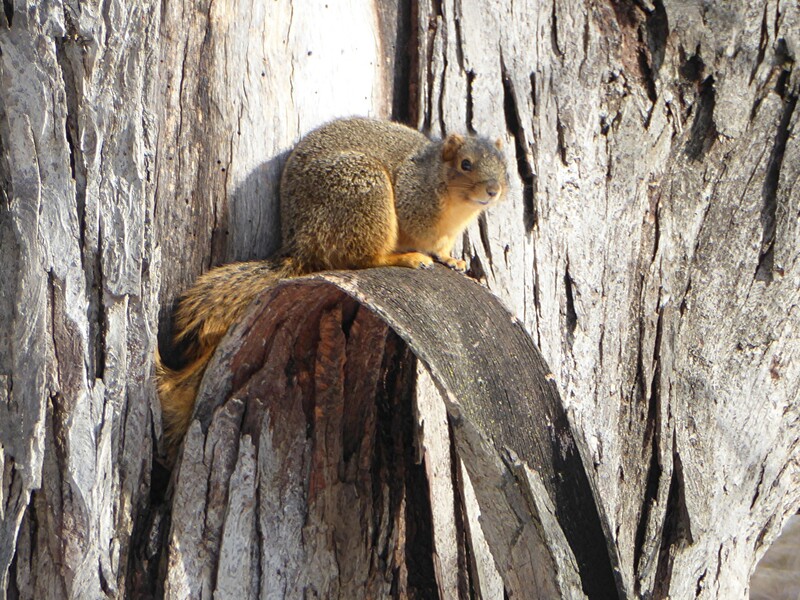 Not far from the concentration of waterfowl on Scioto River this Fox Squirrel was trying to warm up in the 10F sunshine, Griggs Reservoir Park. Nearby an immature Yellow-bellied Sapsucker was also spotted, Griggs Reservoir Park. Our friend Ed told us about two Eastern screech owls located not far from Griggs Reservoir Park and was kind enough to send some pics our way.
. . . and a red morph, Ed. Ed and Bob, photo courtesy of Sheila. Returning home after a recent outing we were treated to some interesting bird activity right in our front yard. Dark-eyed Junco. 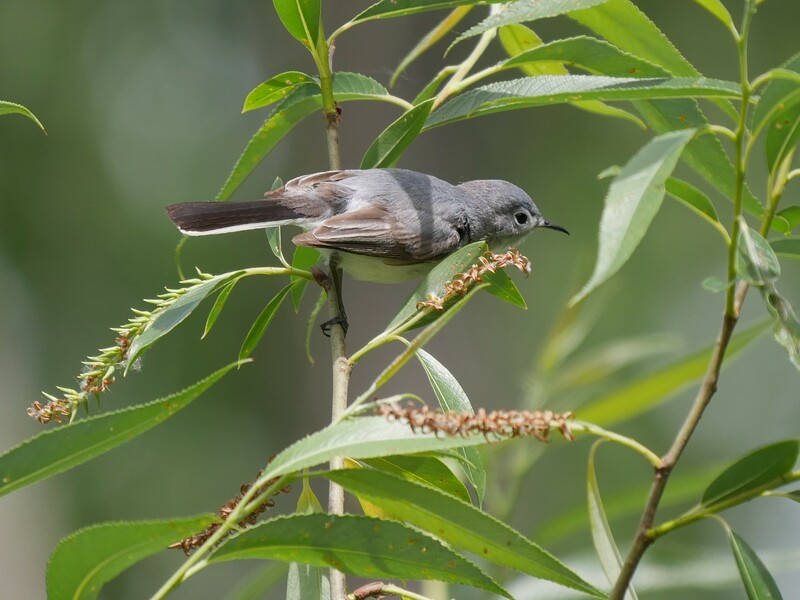 “Dark-eyed Juncos breed in forests across much of North America and at elevations ranging from sea level to more than 11,000 feet. They are often found in coniferous forests including pine, Douglas-fir, spruce, and fir, but also in deciduous forests such as aspen, cottonwood, oak, maple, and hickory. 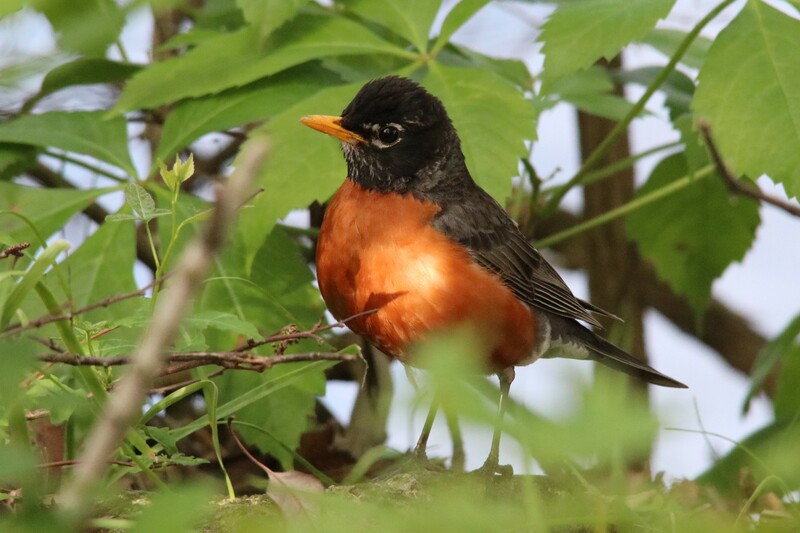 During winter and on migration they use a wider variety of habitats including open woodlands, fields, roadsides, parks, and gardens.” Ref: Cornell Lab. Competing with a Gray squirrel for goodies. The chickadees love the sweetgum tree. And so do the goldfinches. A female Downy Woodpecker also takes advantage of the front yard feeders. 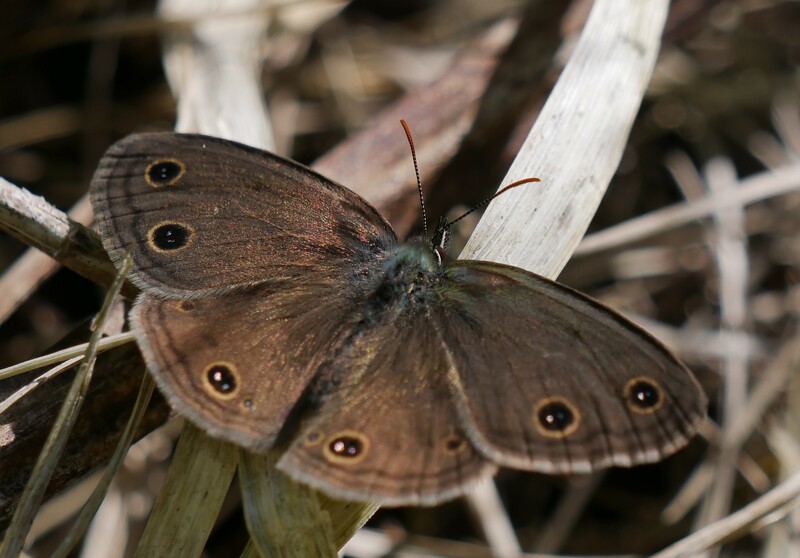 We feel very blessed to have so many fascinating creatures paying us a visit this winter. A very warm coat, that didn’t get worn once last winter, has come in very handy the last few days as we’ve been out and about. Today, as I finish writing this, the temperature is a balmy 35F. Time to get out and see what else we can find! Finally, one of the joys of being a lover of nature is meeting kindred spirits like Ed and Sheila when out in the field. Ed, thanks again for supplying the pics! 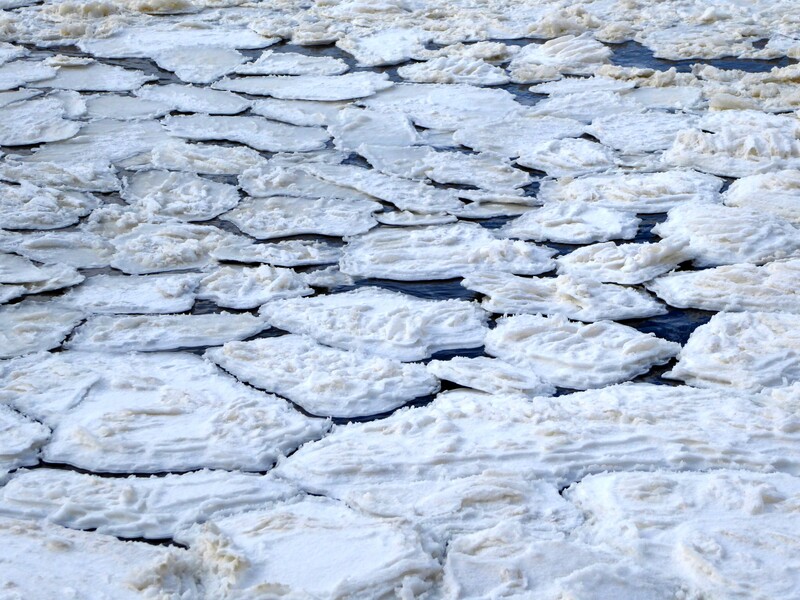 Flowing water and extremely cold temperatures create ice pancakes along the Scioto. Outings in small boats can provide a unique opportunity to view and photograph wildlife. While we don’t pursue birds in our canoe, one will often take flight when approached. When it does, often crossing right in front of us, it offers an opportunity to get a nice “in flight” profile shot. Gliding silently without paddling often provides a chance to get very close to birds thus offering a photographic opportunity that may not be found while hiking. Note: underlined text denotes a link which may be clicked on for additional information. 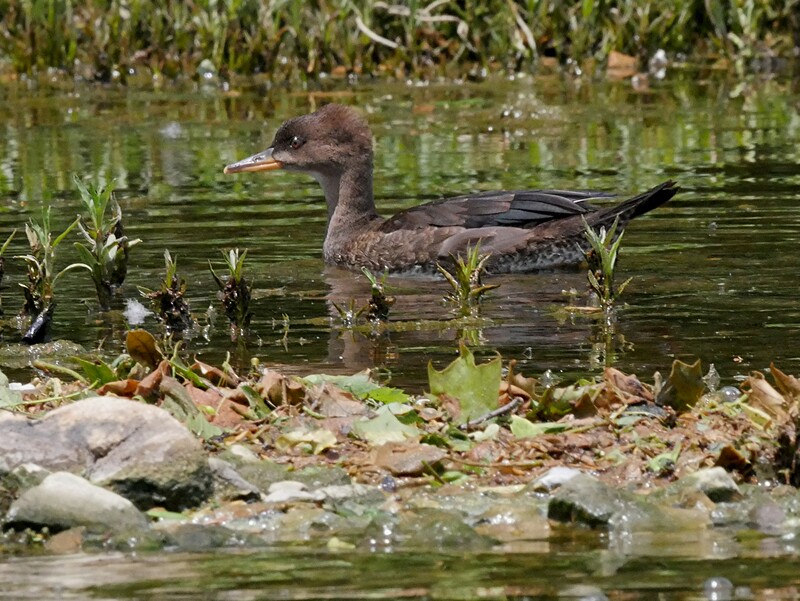 Immature Common Merganser, from the canoe on Griggs Reservoir, (Donna). 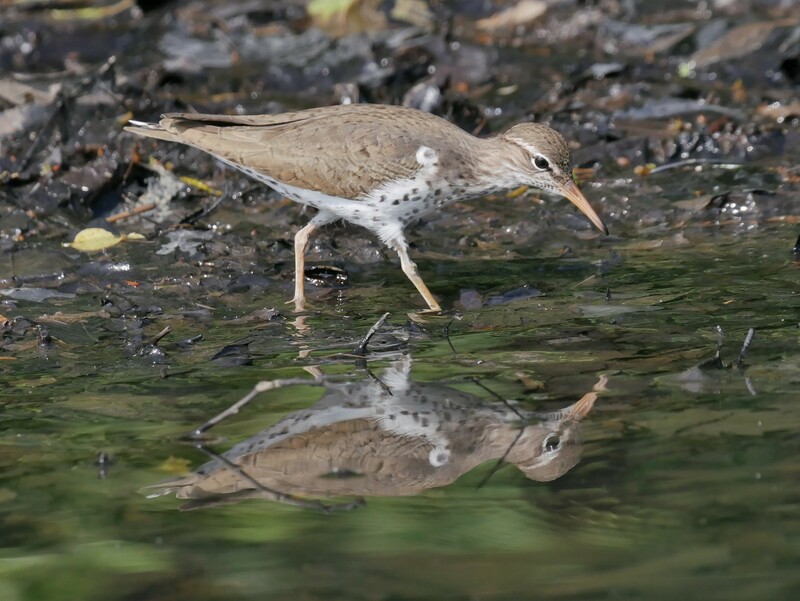 A Spotted Sandpiper let us get very close, from the canoe on Griggs Reservoir, (Donna). 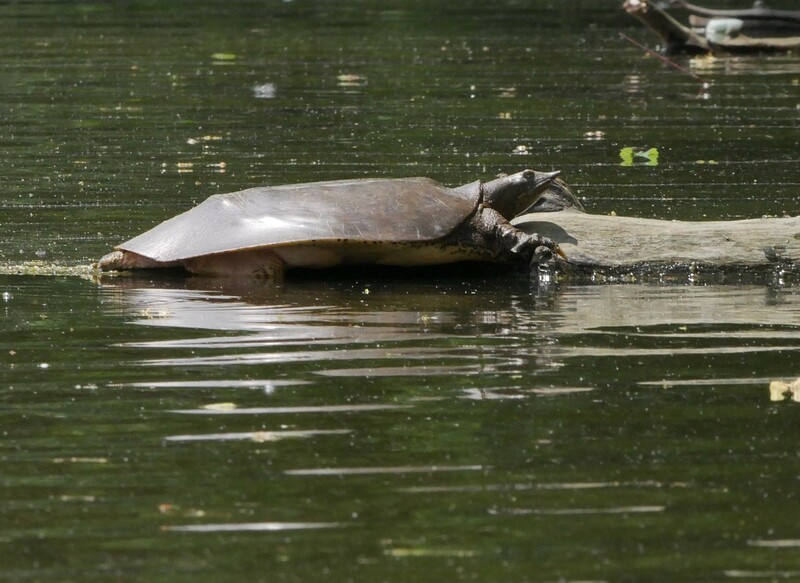 Easter Spiny Softshell, from the canoe on Griggs Reservoir, (Donna). 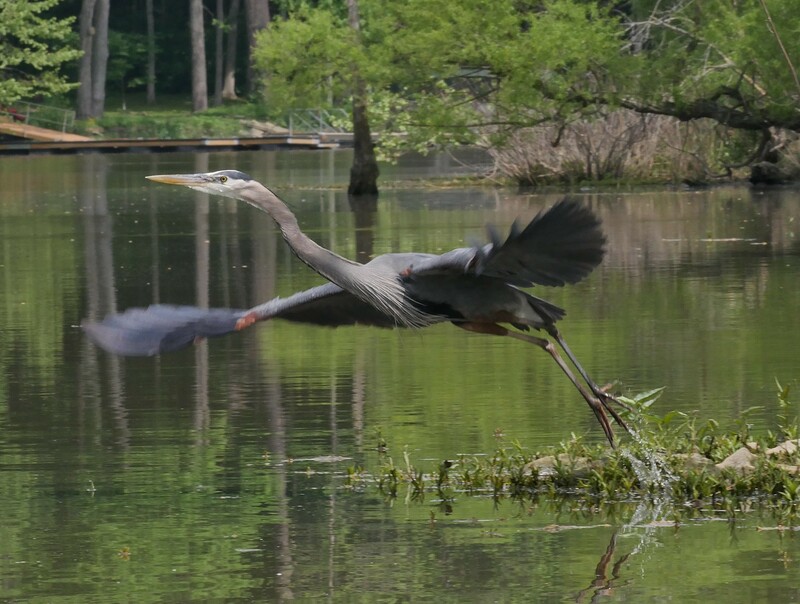 As we get closer a Great Blue Heron takes flight, from the canoe on Griggs Reservoir, (Donna). Near the end of our paddle we spot a Great Blue Heron trying to figure out what to do with a just captured snake, from the canoe on Griggs Reservoir, (Donna). 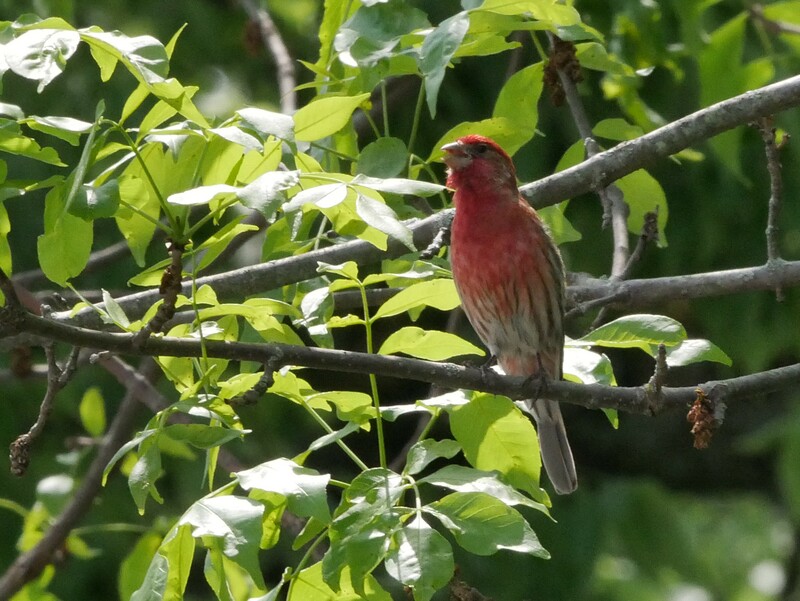 Male House Finch, from the canoe on Griggs Reservoir, (Donna). 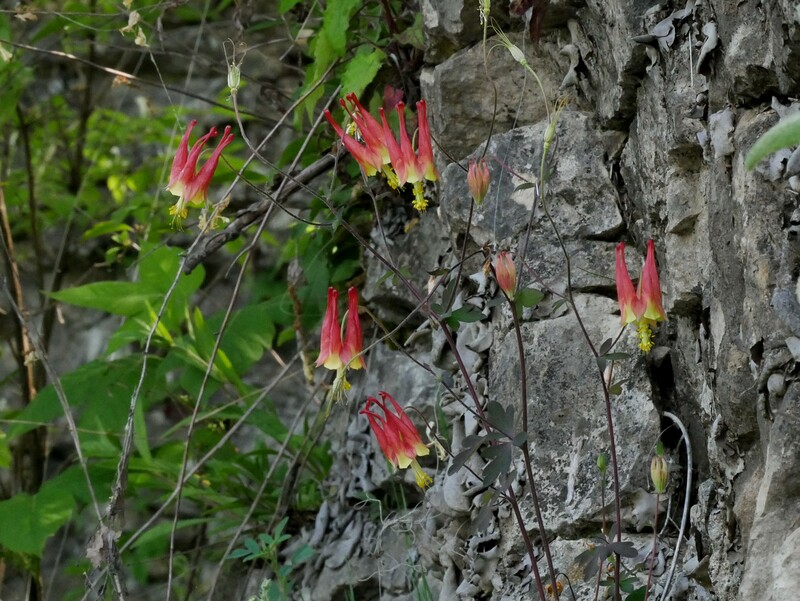 A few days ago Wild Columbine was still in bloom along Griggs Reservoir’s the low cliffs, from the canoe, (Donna). A small boat may also allow access to hard to reach points of interest for which there is limited or no access on land. In this case it was one named and one unnamed waterfall along Griggs Reservoir that were energized by the recent rain. Entering a small creek leading to one of Griggs reservoirs waterfalls. I’ve paddled as far as I can but fortunately it’s only a short walk to the falls. Good flow over the falls which are about 6-8 feet high. The shot taken under cloudy conditions which controlled shadows. Take 2. I’m not sure which shot I like best. 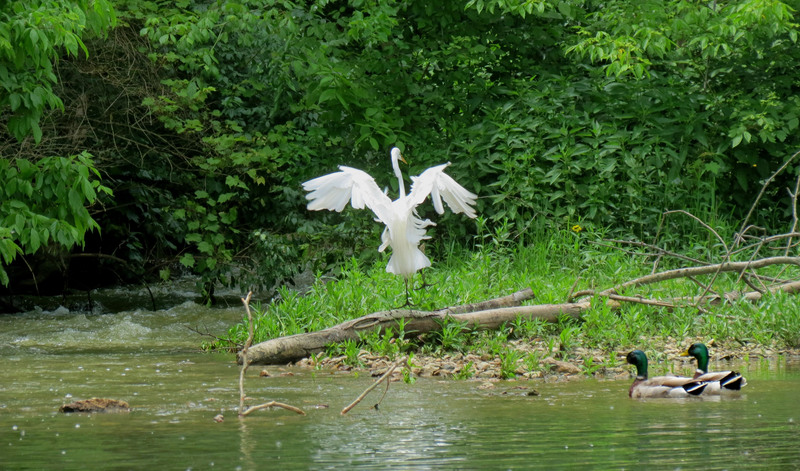 Paddling into the cove at Hayden Run Falls a Great Egret does a welcoming dance as two mallards look on. 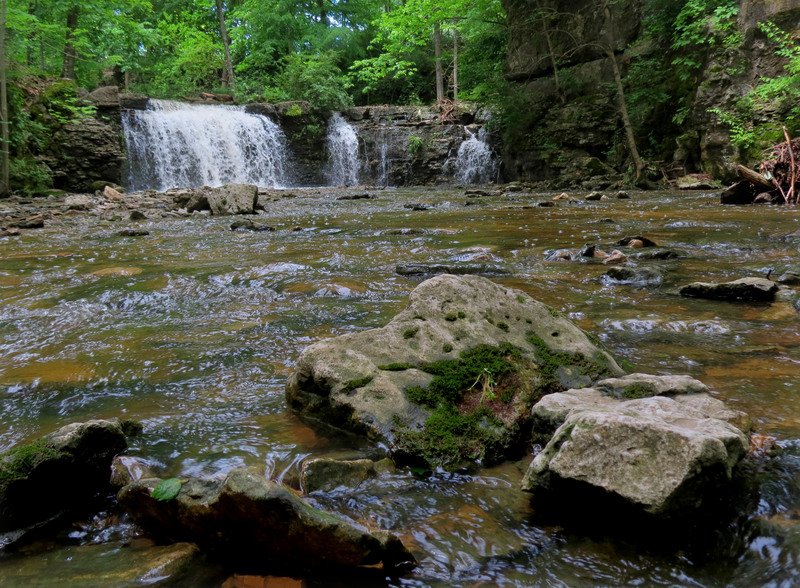 Hayden Run Falls, about 35 feet high, benefitted from the recent rain. From the canoe pullout a not so easy hike up a rain swollen creek was required to get to the falls. Normally when using a digital single lens reflex I would have opted for a slower shutter speed to create a sense of motion in the water but a Canon SX40 superzoom and the lack of a tripod limited my options. 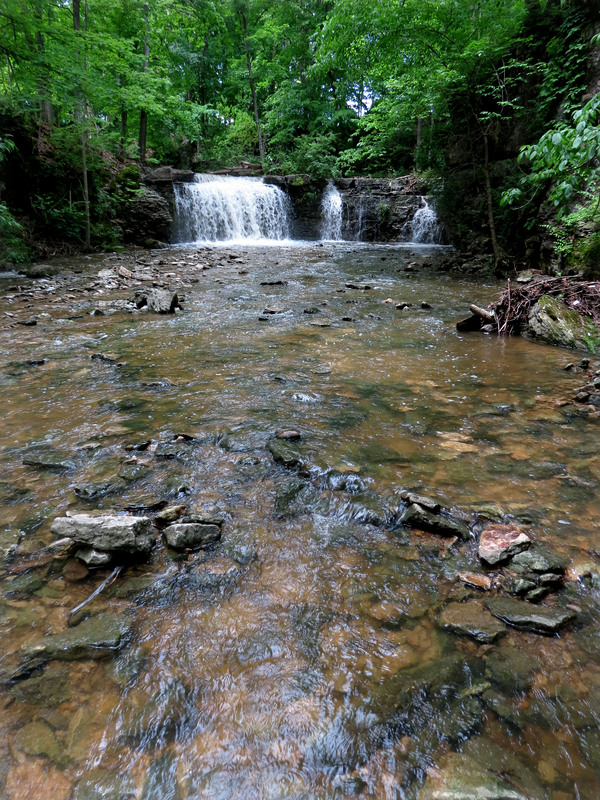 Hayden Run Falls is also accessible via a boardwalk with parking provided off Hayden Run Road. Take 2. Again, I’m not sure which shot I like best. When paddling it’s sometimes hard not to do a little cleanup. However, trying to clean up plastic, not to mention all the other stuff, after it’s already in the environment is next to impossible. While some litter is thrown directly into the reservoir, much finds it’s way in by way of storm drains. The reservoir, home to an amazing amount of biodiversity, thus becomes an aquatic “trash can” for a good percentage of the city’s litter. This phenomena can be observed to a greater or lesser degree in all of Ohio’s lakes and streams. 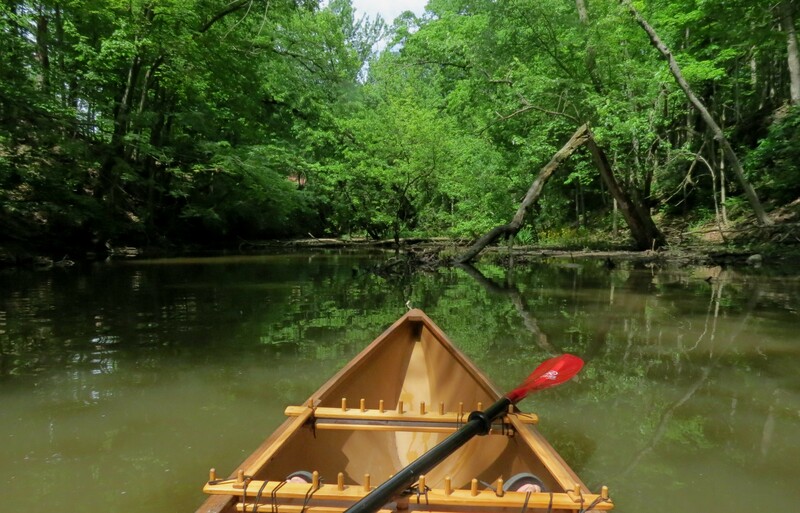 Paddle lakes and streams in states like Michigan or Maine and it’s obvious that a Ohio Beverage Container Deposit Law would largely eliminate this problem. In the past week, when not in the canoe, we’ve had opportunities explore Griggs Reservoir Park as well as a few other favorite spots. 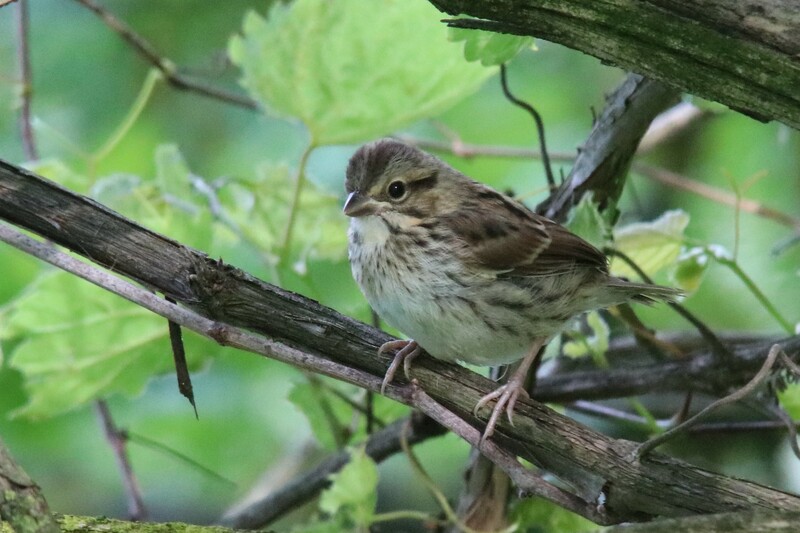 Immature Song Sparrow, Griggs Reservoir Park. I know it’s a very common bird, but the lovely light compelled me to take the picture, Griggs Reservoir Park. 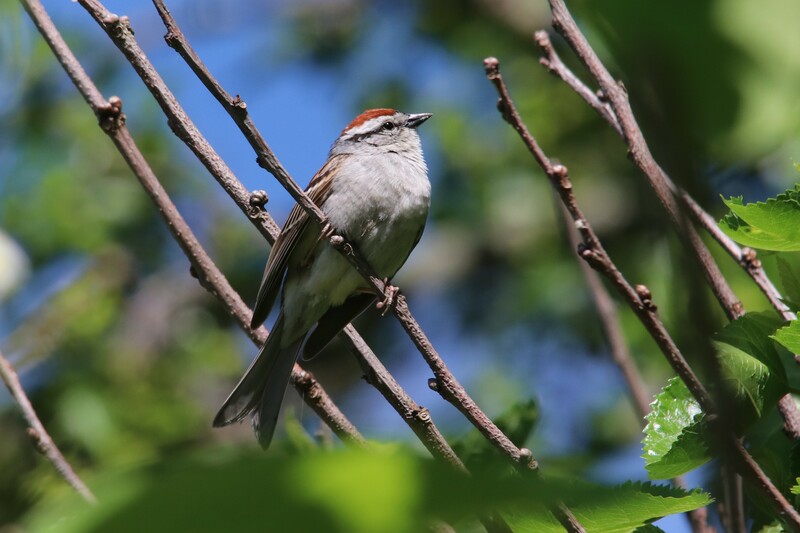 Chipping Sparrow, Griggs Reservoir Park. 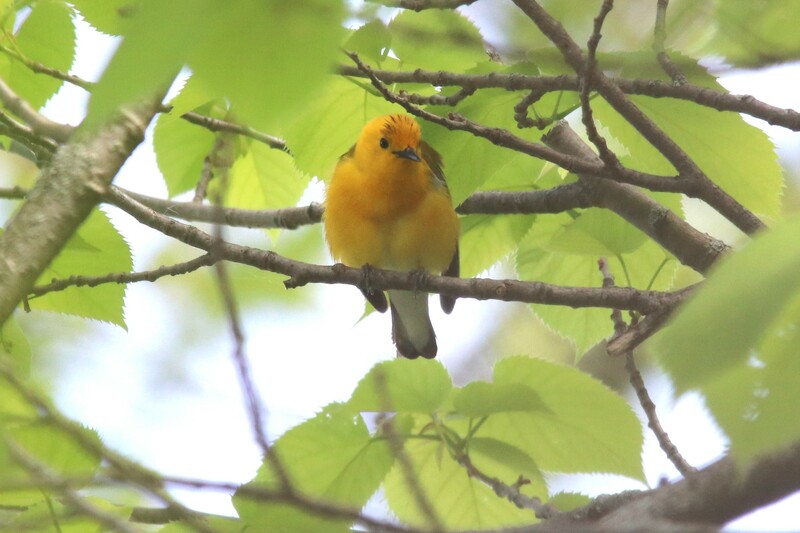 Protonotary Warbler, Kiwanis Riverway Park. 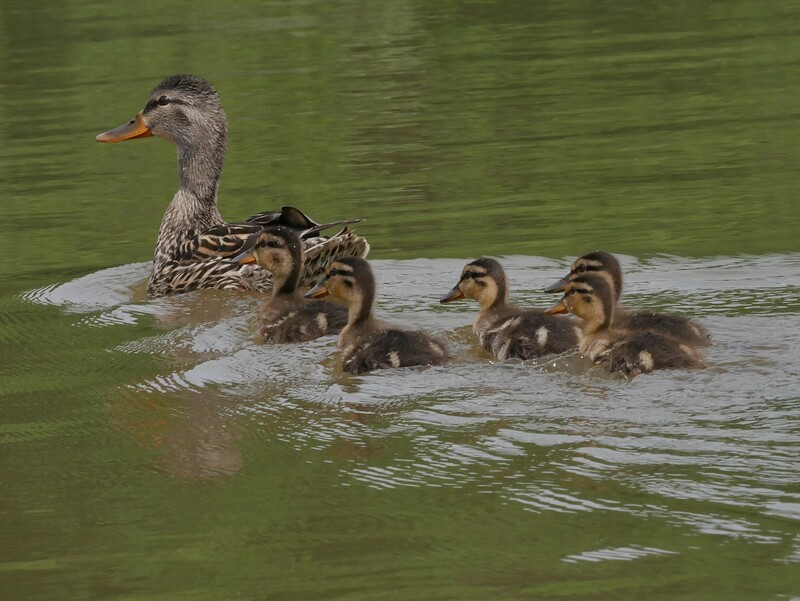 Mother Mallard with babies, Griggs Reservoir Park, (Donna). 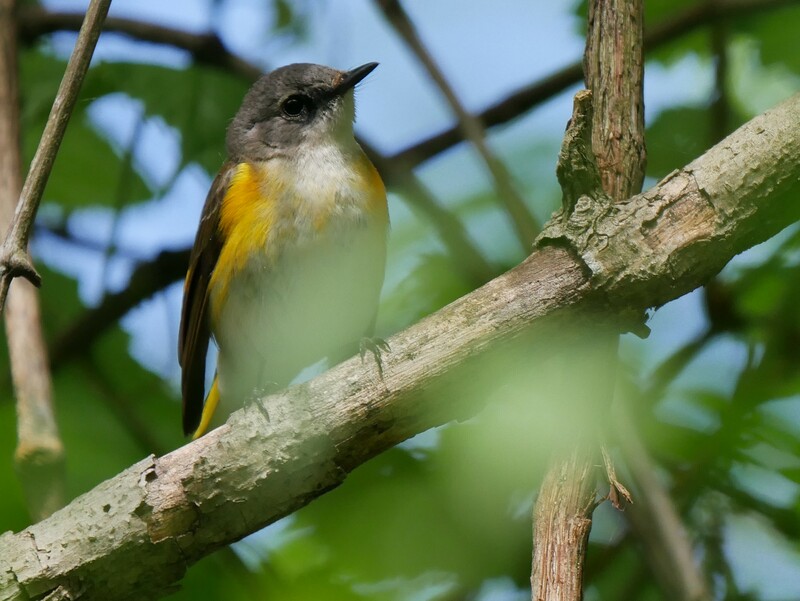 Perhaps the tail end of the warblers a female American Redstart poses for my wife, Griggs Reservoir Park, (Donna). 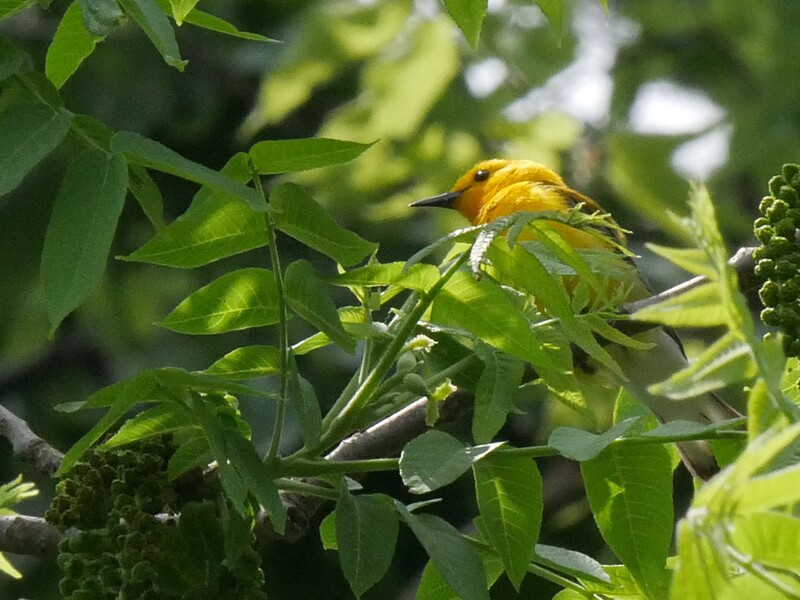 Baltimore Orioles continue to be quite common in Griggs Reservoir Park. 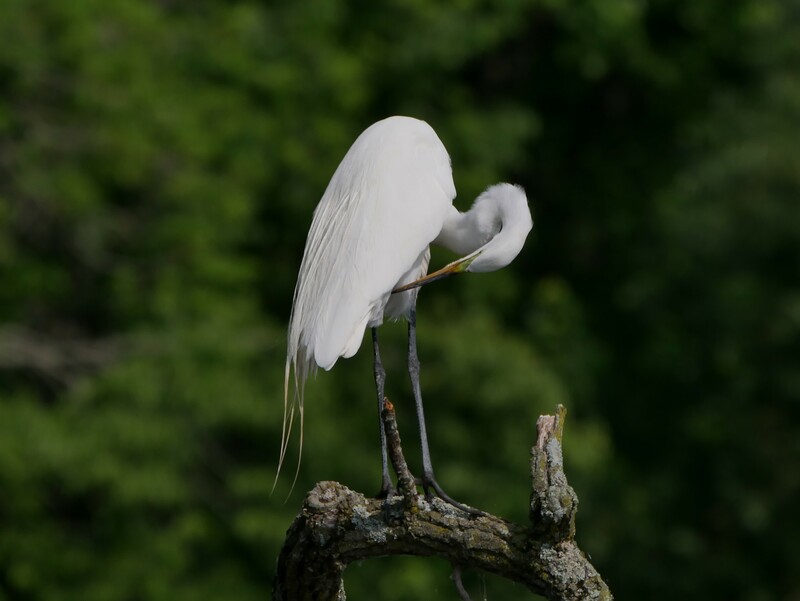 Great Egret preening, Griggs Reservoir Park, (Donna). 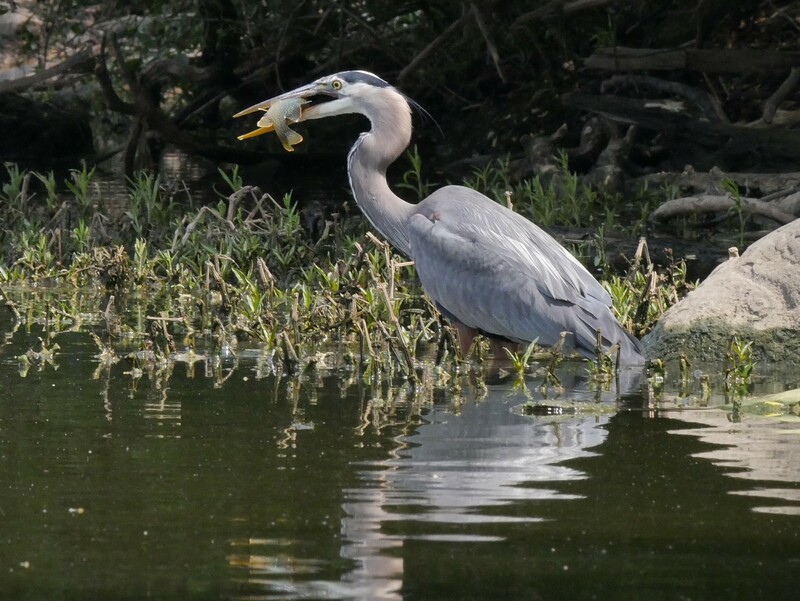 Great Blue Heron with fish, Griggs Reservoir Park, (Donna). 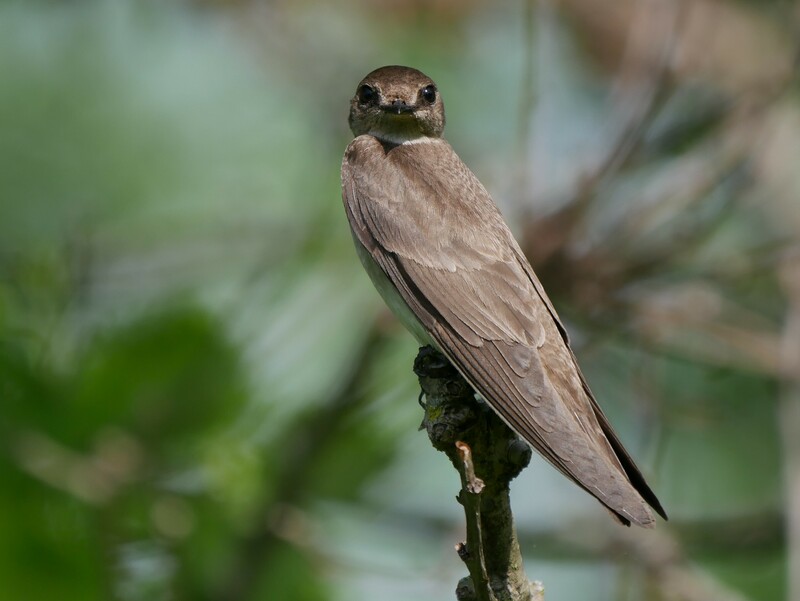 Northern Rough-winged Swallow, Griggs Reservoir Park, (Donna). Blue-gray Gnatcatcher Griggs Reservoir Park, (Donna). 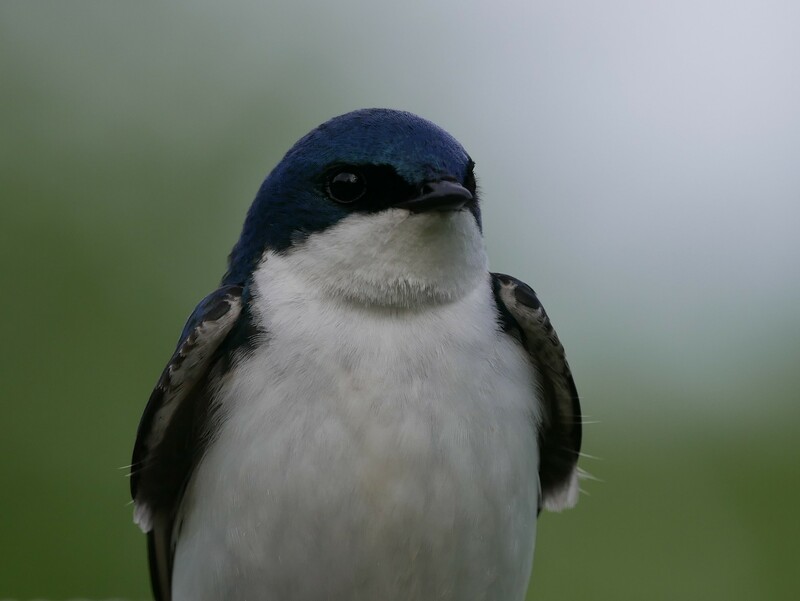 Tree Swallow, O’Shaughnessy Nature Preserve, (Donna). 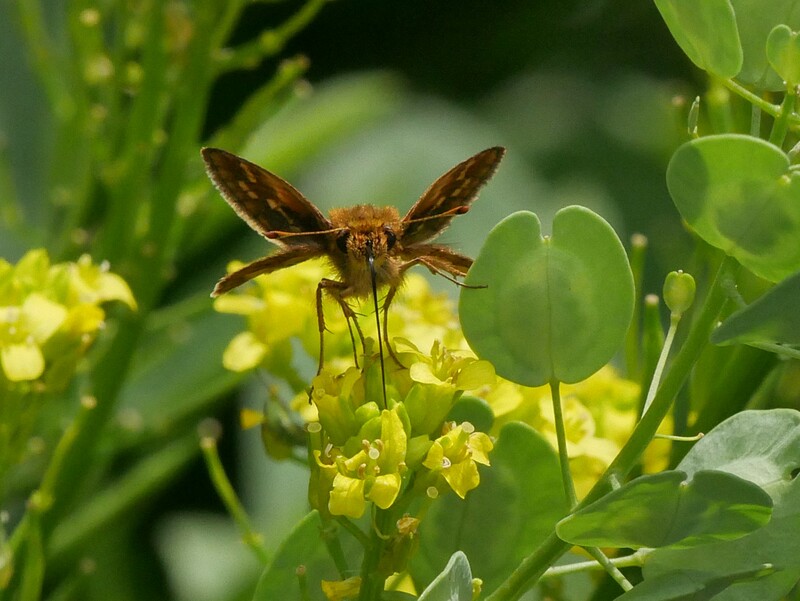 Zebulon Skipper, Griggs Reservoir Park, (Donna). Little Wood-sater, O’Shaughnessy Nature Preserve, (Donna). Grape Leaffolder Moth, Griggs Reservoir Park, (Donna). 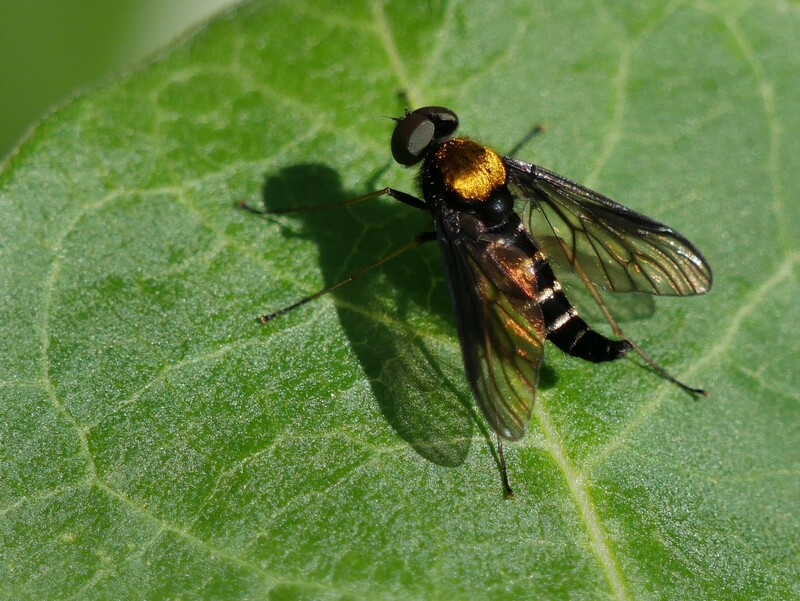 Golden-back Snipe Fly. 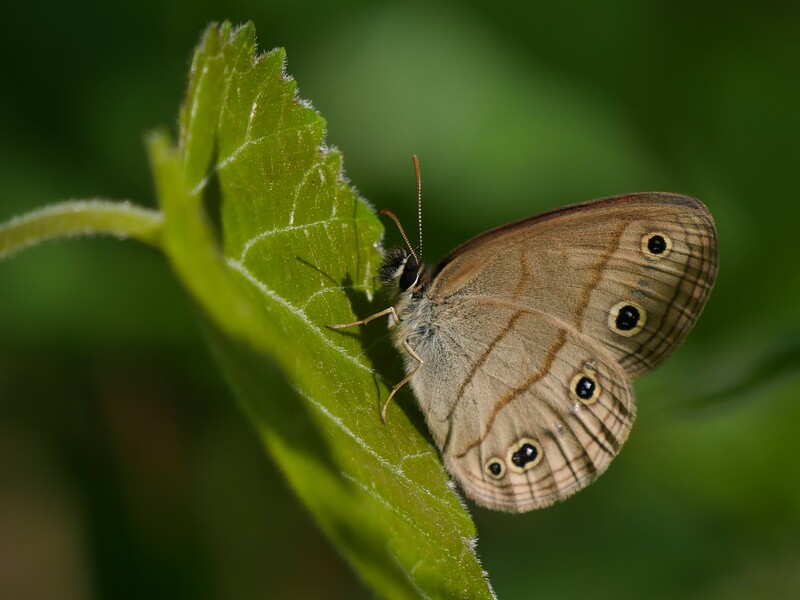 Adults and larvae feed on a variety of small insects, O’Shaughnessy Nature Preserve, (Donna). 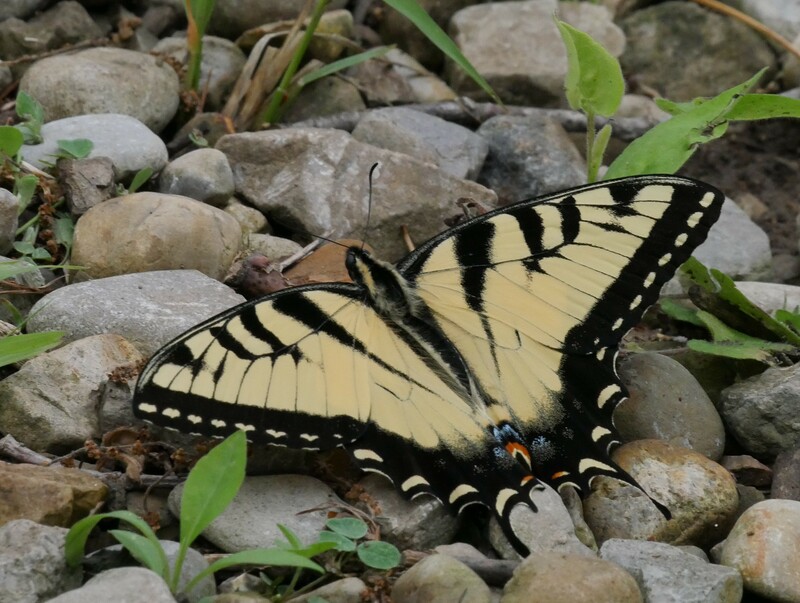 Eastern Tiger Swallowtail, Griggs Reservoir Park, (Donna). 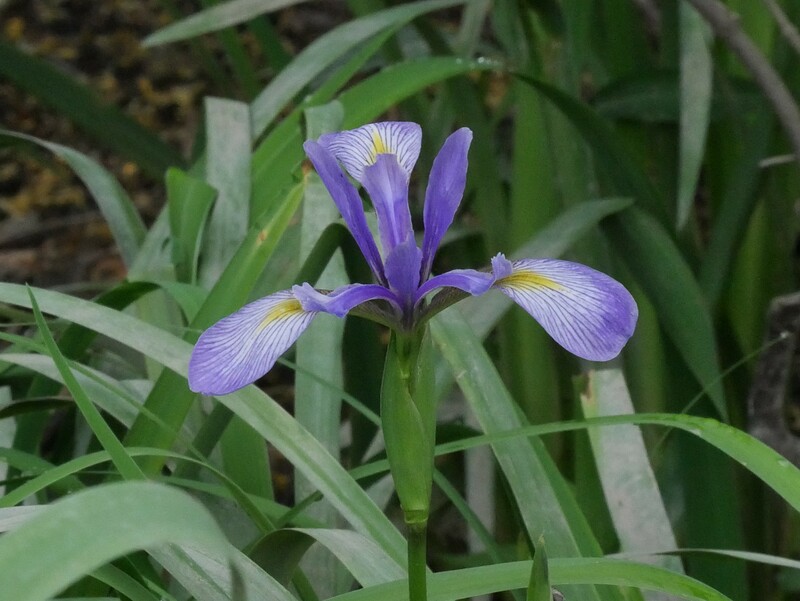 Blue-flagged Iris, Griggs Reservoir Park, (Donna). 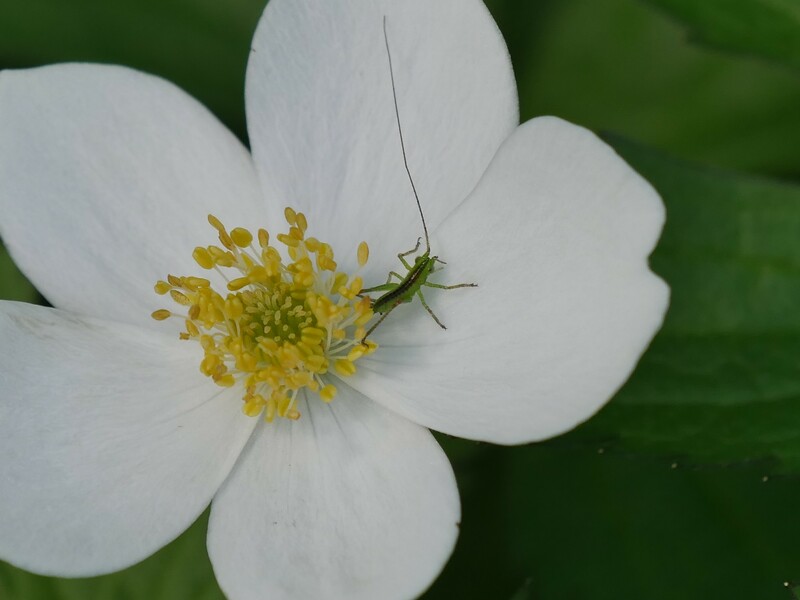 Canada Anemone, Griggs Reservoir Park, (Donna). Hairy Beardtongue, Griggs Reservoir Park. 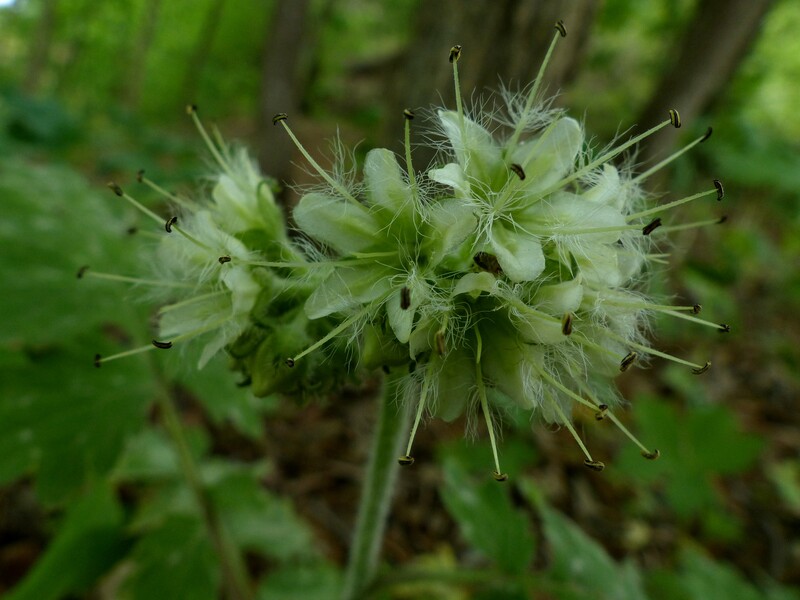 In my humble opinion the flower of Virginia Waterleaf is not nearly as pretty as it’s early spring leaves, (Donna). 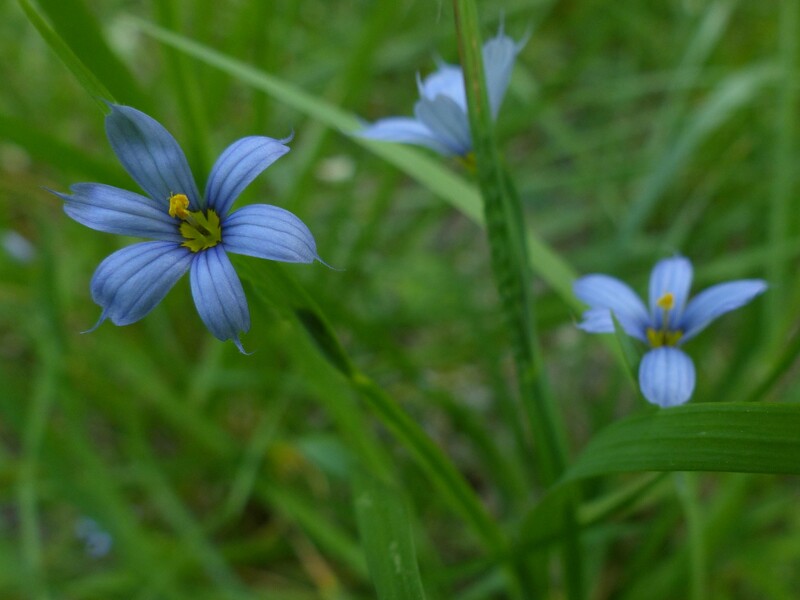 Blue-eyed Grass, Griggs Reservoir Park, (Donna). 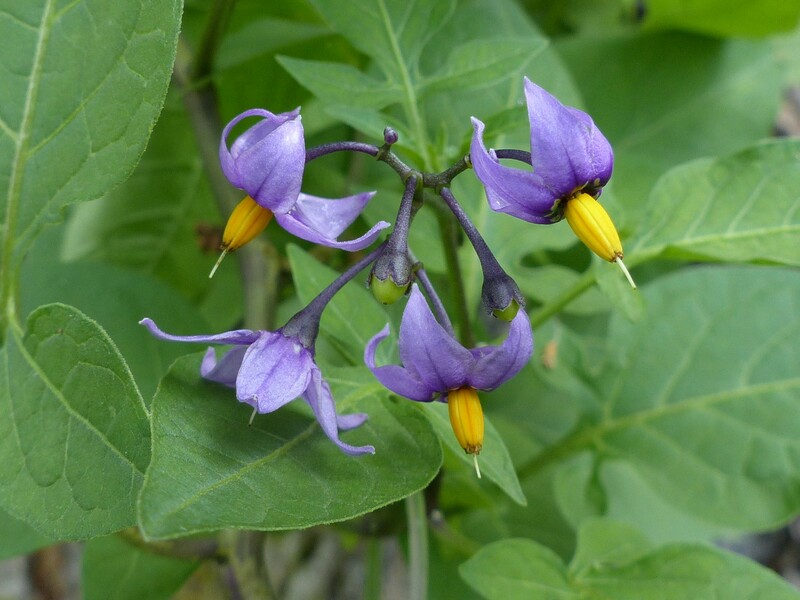 Bittersweet Nightshade, Griggs Reservoir Park, (Donna). 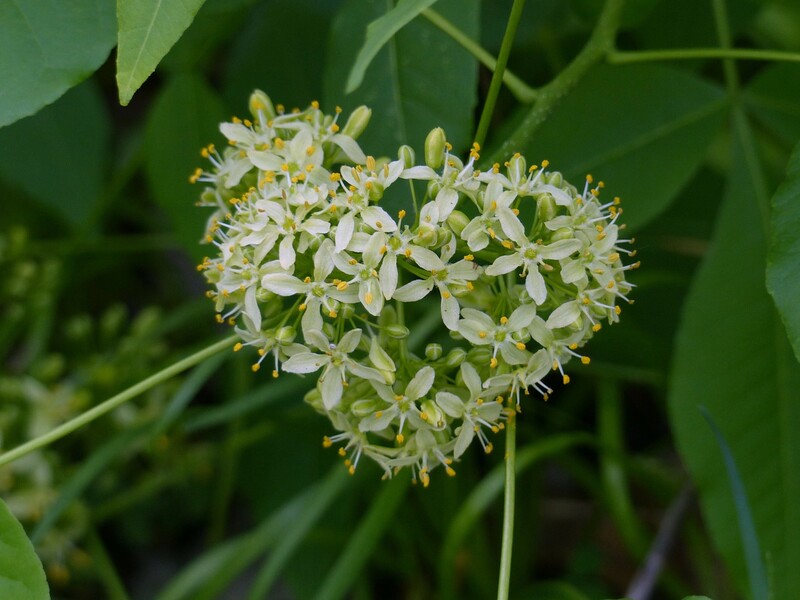 Wafer Ash flowers (not always in the shape of a heart), Griggs Reservoir Park, (Donna). 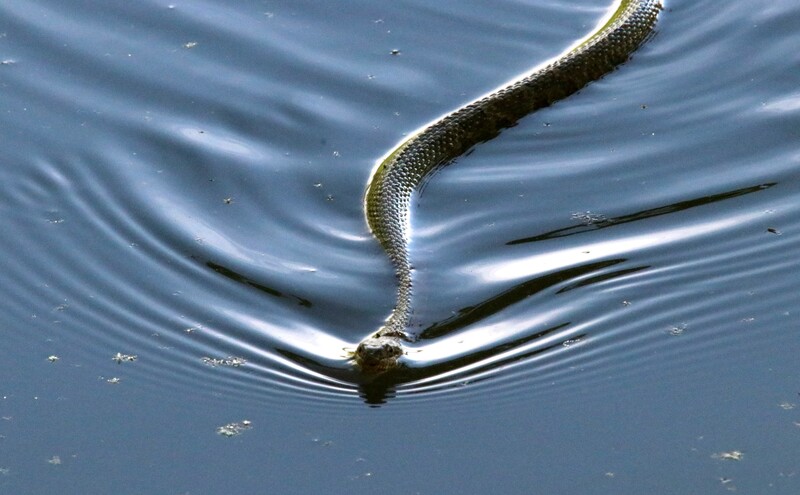 A Northern Water Snake creates patterns on the otherwise still surface, Twin Lakes, O’Shaughnessy Nature Preserve. 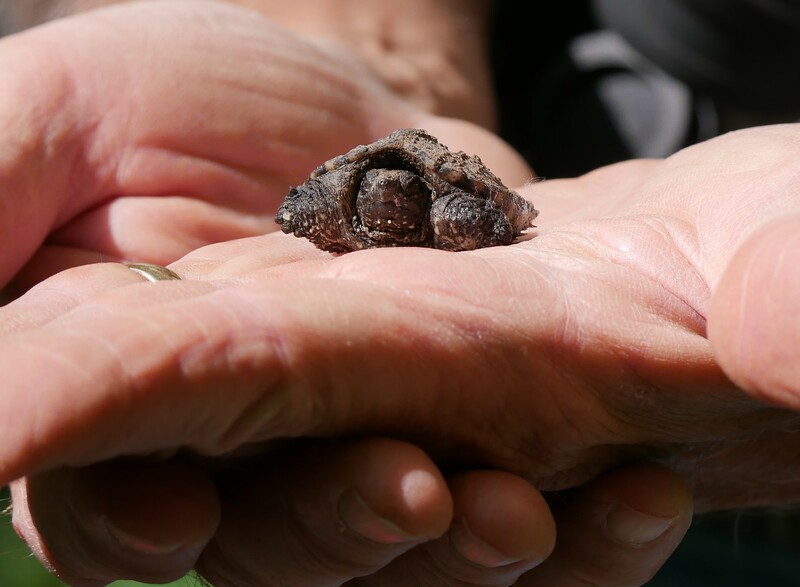 Very small Snapping Turtle, Kiwanis Riverway Park, (Donna). After quite a bit of rain the fungus is doing well in Griggs Park. The view down a short path leading to the reservoir shows the vegetation to be almost fully leafed out. 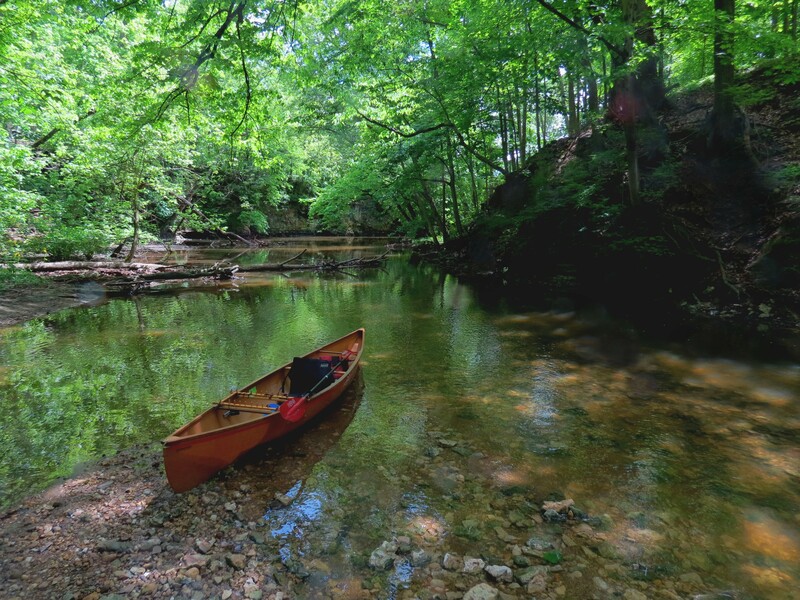 A special thanks to my wife for supplying many of the photos in this post included those from the canoe as I handled the boat. 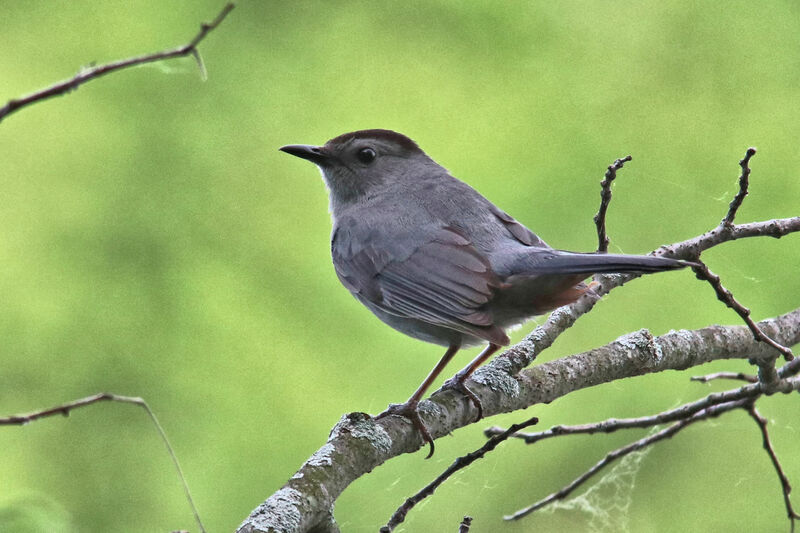 Given that spring is winding down, my guess is that future posts will contain fewer warbler pictures and probably more insect pictures but one never knows for sure. Future posts may also document new Ohio places explored or at least unique places that haven’t been visited in awhile. Until then, thanks for stopping by. February in Ohio has left us shivering. The abnormally cold weather has resulted in frozen lakes and reservoirs both here and further north. The open water that remains provides refuge to waterfowl that would normally be much more dispersed. One such area is the Scioto River below Griggs Reservoir. Below is a partial photographic inventory of the birds seen there in the last day. 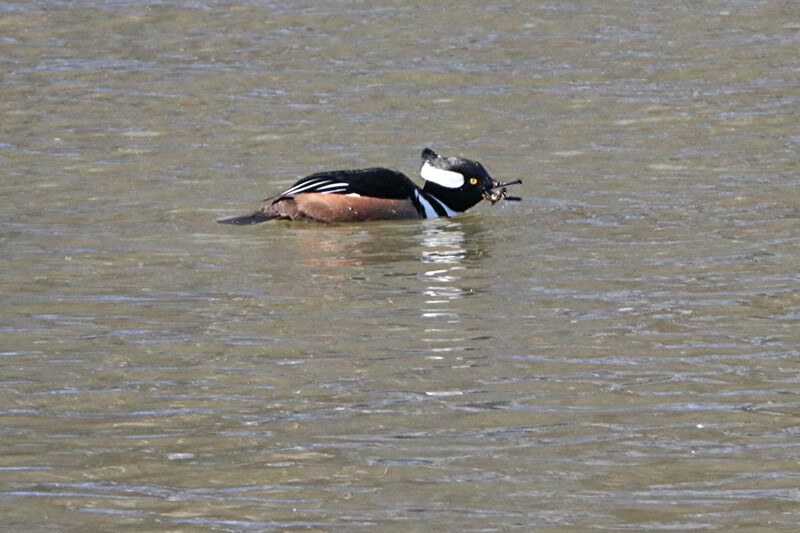 Some, such as the Common Golden Eye and Hooded Merganser, are fairly common winter visitors. Others are less so, and because of that they are a real treat to see. 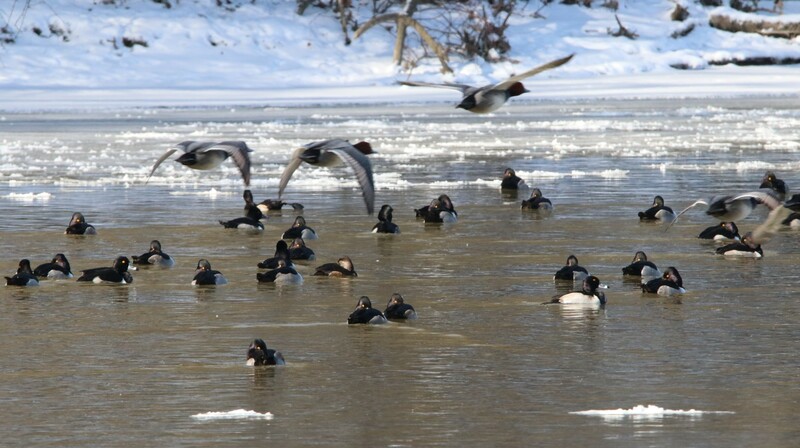 Common Goldeneyes and Ring-necked Ducks cruise the opposite shore, Scioto River below Griggs. Red-breasted Mergansers join the Goldeneyes. What appears to be a lone Western X Glaucous-winged hybrid. Common Mergansers almost avoiding the camera. Great Blue Herons not wanting to have their picture taken. A Red-breasted Merganser tries to fit in. A pair of Canvas Backs, a Black Duck, and a female Bufflehead almost go unnoticed. 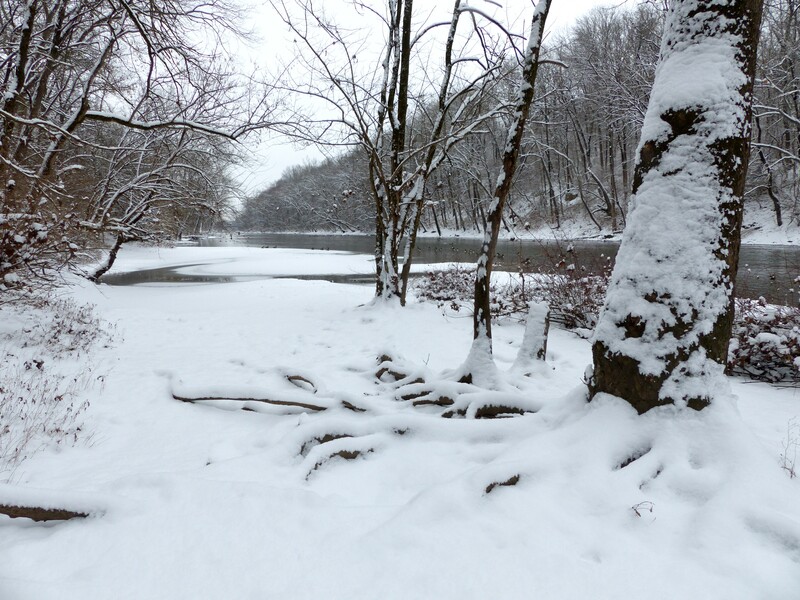 We often think of there being less biodiversity in winter but the Scioto River below Griggs dam opens our eyes. Thanks for looking in. What do you need to do to get a drink around here? The other morning it was below freezing when I looked out the window and observed a Downy Woodpecker getting a drink. Had snow been on the ground I doubt it would have gone to this much trouble. But then again, who really knows the mind of a woodpecker. Downy Woodpecker at frozen bird bath. Sending some more ice particles flying..
Later that day we explored the area along Griggs Reservoir and the Scioto river to see if any new migrating ducks had taken up residence or if a Bald Eagle might be about. We did see a Common Merganser, Ruddy Ducks, Canada Geese, Ring-billed Gulls on the reservoir and an immature Red-tailed Hawk along the river, but alas, no Bald Eagle. My wife continued her quest to discover interesting fungi and lichen. While I managed to get a nice shot of a Red-bellied Woodpecker and a Blue Bird even made an appearance. On the day we took most of the below pictures the birds were showing a real inclination to take flight whenever we got close. We haven’t paid much attention to the color of our clothing so we switched to drabber colors hoping to improve our success with the ducks. It didn’t seem to make much difference. We’re now thinking that they notice our movement even if it’s very slow. Up to speed in just a few feet. Some ducks seemed content not to fly. In recent days we’ve noticed that a Red-tailed Hawk has initiated nesting activities high in a Sycamore along the west bank of the river. Perhaps one of it’s offspring, cruising above the trees not far away. 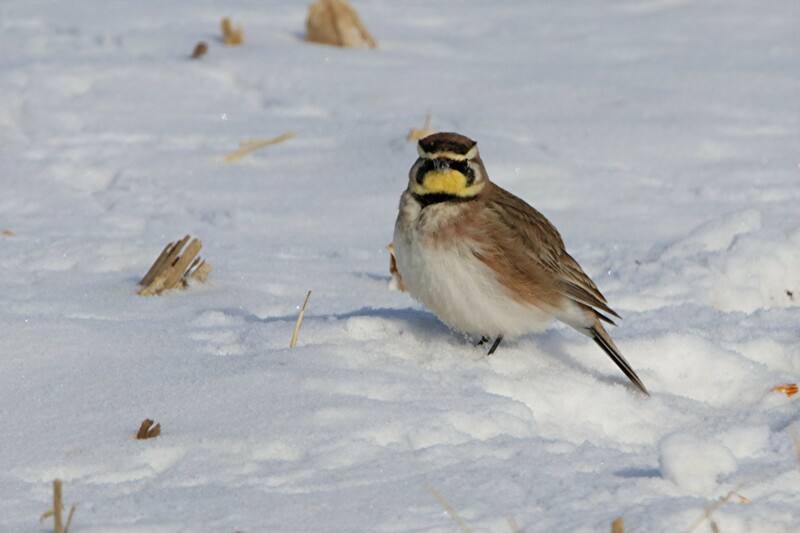 My wife got a beautiful picture of a White-throated Sparrow and we obtained pics of other birds that seemed to be sitting on the side line as the eagles and ducks entertained us. Yesterday was very cold and windy and efforts to photograph birds meant immediately dealing with frozen fingers. The highlight was being in the right place at the right time to get acceptable pics of an immature Bald Eagle as it flew along the river just a mile and a half from our house. We’ve seen a number a eagles in this area but this was the first time we were able to get a picture. This one may have been looking for an unsuspecting duck. In addition to the eagle, we were able to get some reasonable shots of waterfowl along the river. When we arrived home a Coopers Hawk was sunning itself near our bird feeder. Today it was a balmy 45 F and very comfortable but for some reason the birds were a little harder to find. But a few good pics were obtained. Common Merganser. Included for comparison with the pics taken with a Canon DLSR and a Sigma 150-500 lens. No tripod is being used just trees for additional support if available. 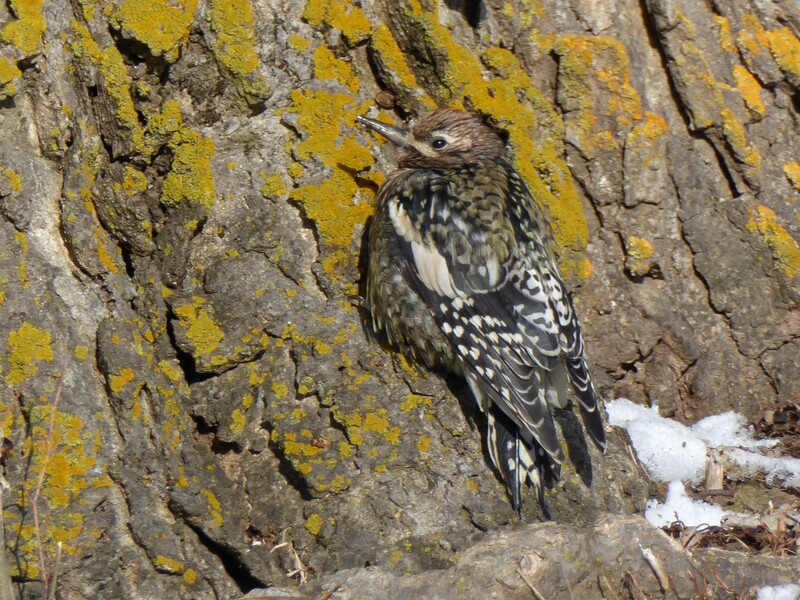 Female Downy Woodpecker, Griggs Park, Canon SX40. Yesterday, with the reservoir again frozen over, we were out looking for waterfowl along the Scioto River below Griggs Dam and spotted some interesting ice formations. 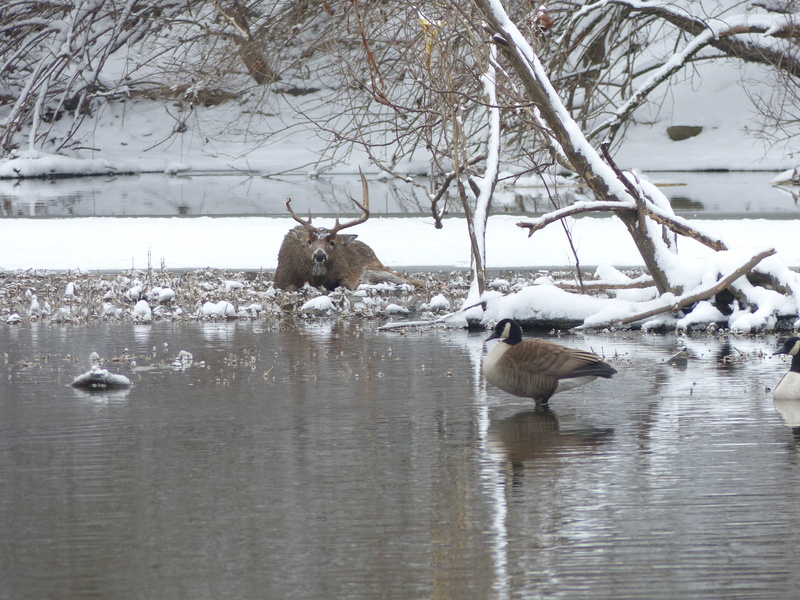 Recent warmer temperature, snow melt and rain had resulted in high water along the river. The formations resulted when this was followed by very cold temperatures and dropping water levels. With the wind was gusting to over 30 miles per hour and the temperature hovering around 15 F our fingers froze almost instantly as we tried to take pictures. Its amazing any turned out as well as these did. For the record we did see Hooded, Common and Red-breasted Mergansers along the opposite shore of the river. Below are our meager attempts to record the sightings.